If you will allow me to re-blog this post so I can share it to my 2 best friends in CA Vancouver, they will definitely agree with you! I’m glad someone else agrees with me about the problem of having too many choices. But I think I would have chosen Pear and Gorgonzola over Garlic. If I was a little wiser I’d have chosen that in the first place. I guess cheese in an ice cream is just like having extra dairy? Some sound yum but I don’t think I could get garlic ice cream past my lips, even though I love them both. Oh, I love them both too, but I’m guessing they don’t cook the garlic that they put into the ice cream so it tastes exactly like licking a garlic clove. Yuck. ohmygosh garlic gelato! i want to taste that now, despite how disgusting you described it to be. Just don’t come crying to me when you’re forced to eat it all! You have been warned. The ice cream was so expensive that even if it was on the bottom I’d have probably forced myself to eat it. Damn those Vancouver food prices! Haha, I did notice the samples, but unfortunately I was so sure that I was going to enjoy the garlic that I didn’t bother. I guess my cockiness was my downfall. I think that corn ice cream is actually really really popular in Asia. It just sounds crazy to me though. Just to say you were ballsy (read:dumb) enough to do it. Did you notice a tendency on the part of people who came near you afterwards to recoil, or possibly to pass out? Garlic icecream? No, thank you very much! Eating garlic bread while reading your post. But I wonder how that garlic ice cream taste like. Would be nice to try with all that forecast to sweat through its hottest in Brisbane. Thanks for the visit Dan. Thanks for liking my blog – really liked this entry. A few weeks ago I tried two new things – crocodile pizza, which tasted OK at first but left a weird after-taste, and the delicious liquorice ice cream they make here in Australia. Haven’t seen any garlic ice cream but will learn from you and avoid. Thanks. Oh man. I live about an hour north of Gilroy, California–garlic capital of the world. They have a garlic festival every year, with garlic wine and garlic ice cream and garlic this and garlic that. I’ve always been tempted to go and try it, but I might just learn from your experience and stick with the tried and true. I actually contemplated going to that festival a few summers back when I was in Oregon. I love garlic! Just…this garlic bread was absolutely foul. 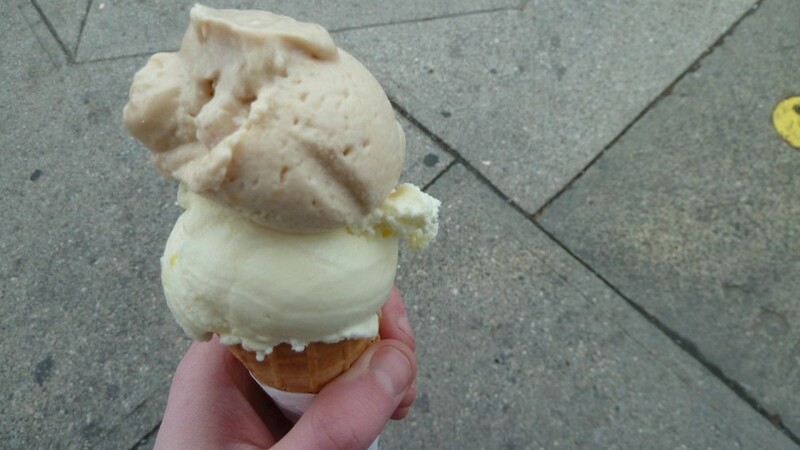 Garlic ice cream! Awesome! I’m from a little town in Gilroy, CA that claims to be the “garlic capital of the world”. Well, we were at one time, but now we just have a massive garlic festival every year and there is always garlic ice cream for sale! I didn’t think it was so bad . . . The person above you is from near Gilroy too. I might have to try getting there, but I wont be eating any ice cream…I think the problem is that the garlic isn’t cooked for the ice cream, perhaps? Just like licking raw garlic. Ugh. Not good. Hahaha, garlic sounds pretty foul. I had liquorice ice cream once, which nobody else seemed to like, but I thought it was pretty nice. This shop in Vancouver sounds a lot better than the quaint little ice cream vendor in the smallest city of the United Kingdom, though. I LOVE liquorice ice cream! We’re clearly kindred spirits because I’m aware that barely anybody likes it. Two thumbs up for you. Some things should not be eaten regards rob. I am so excited to read all of this, you mentioned Willy Wonka and Sake in the same breathe – but I fear you used “sake” in the personal term, as in “for my own sake, not yours,” and not as rice wine…. FORGIVEN. But Forbidden. For if Wonka would have only made a Japanese Rice Wine Candy…. well the images are endless. Willy Wonka’s Neverending Sake Candy Sticks. I’d try those for sure! You, sir, chose the wrong garlic gelato shop. Over here in Michigan (where it’s so cold we *have* to specialize in frozen treats) there”s a gelato shop that sells absolutely delicious sweet cream & garlic gelato. They also have maple-bacon (yum). How does one even sell 218 flavors of ice cream? This place has maple-bacon too! I’m torn about whether that’ll be nice or not. I’ve had maple-bacon stuff before and loved it! But in an ice cream? Hmm. Might have to get back to you on that one. That’s AWESOME! Some things should NOT be made into icecream It’s an insult to the existing yummy cream. Carmalized Pear and Gorgozola goes well on pizza. Probably my favorite. But CORN. That cracks me up, not creamed corn? They couldn’t have called it “Just corn” – that would be funny. They ran out of clever names! What’s next a green/salty ice cream called Booger? (I’m afraid no one would try that) How ’bout Pickle? If you can swing an ice cream tour one day, there’s a place in Missouri that keeps trying to sell cicada ice cream. I think I’d be tempted to try the corn ice cream. And thanks for the like!